I love eating at Chipotle. I rarely go to a fast-food restaurant these days, so every trip is considered a special treat. When I go to Chipotle, it’s usually when I’ve run out of salad for lunch at work and I didn’t have time to go to the store the night before. I always get a buritto bowl with black beans, brown rice, a little bit of lettuce, cheese, and roasted chili-corn salsa. Love it! This week’s recipe reminds me a bit of this favorite fast-food indulgence. First, rinse and sort the dried beans, discarding any blemished ones or any grit. Let them soak for 12 hours in a bowl along with 6 cups water. Drain the beans. In a large saucepan, cover drained, soaked beans with 6 cups of fresh water. Bring to boil, reduce heat and simmer, partly covered, and topping up with water if necessary, for about 1 hour. Drain the beans. In a medium pot, heat the olive oil over medium heat. When shimmering and hot, add the onions and sauté for 4-5 minutes, stirring often. Add the garlic and stir for a minute or two until the garlic is fragrant, being careful not to burn the garlic. Stir in the frozen corn and black beans. Cover and let the post sit off the heat until the corn and beans are heated through, about 5-6 minutes. Stir in the cilantro. Serve warn or chilled – it is delicious both ways! 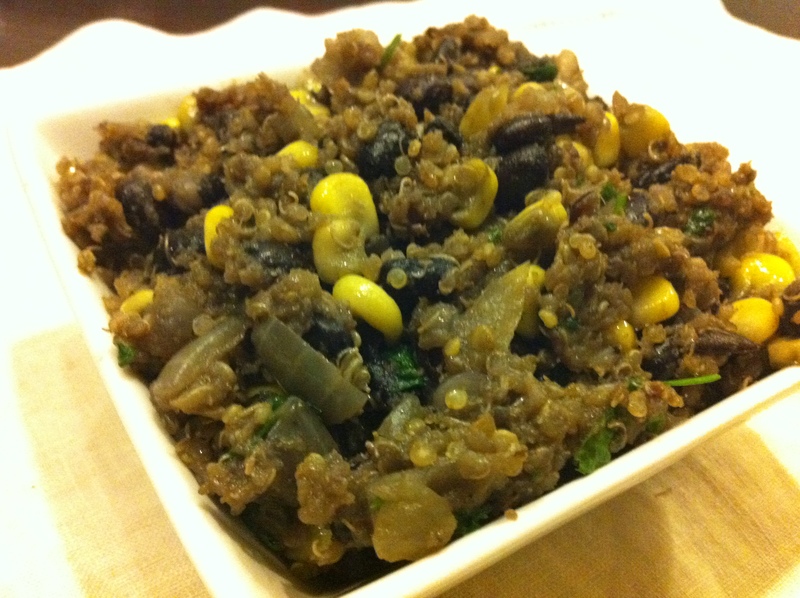 I let the black beans sit in the quinoa mixture longer that 6 minutes, so the quinoa turned a gray color. It still tasted yummy! Just add some lettuce and cheese and I now have my own homemade burrito bowl. Like many projects that I have going on right now, I procrastinated on cooking a new recipe this week until the very last minute. No really, I started this week’s recipe about 2 hours ago (after I stopped playing Tiny Tower) and just finished enjoying my first dish. After last week’s disaster, I think I was a bit reluctant to get back in there and try something new. I finally decided on Friday that I would make another “soup/stew” recipe since the first one I tried turned out great. This week’s recipe was a success! 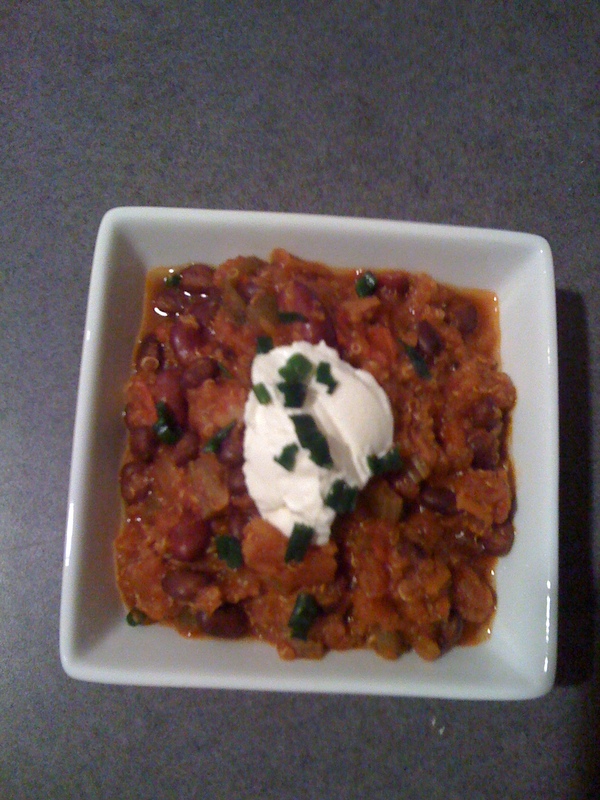 After browsing through Pinterest, I came across a vegetarian recipe for chili that uses quinoa, my favorite rice substitute. Since I had most of the ingredients on hand, I thought I would give this one a try. I did make a couple of substitutions since I’m not a big fan of using canned products when I can easily buy the fresher version. I used dried kidney beans and black beans that had soaked the night before instead of the canned beans and I used 10 medium tomatoes instead of the canned tomatoes. That’s it! It does take a while to prep everything, but it was really easy to cook. I was able to freeze the rest of it so I should be set for the next couple of weeks. Hopefully, you’ll give this recipe a try.